Speedskating • Florida native sets 1,000-meter mark at World Cup event. Kearns • Speedskater Brittany Bowe isn&apos;t just a former college basketball player and champion in-line skater, anymore. Now, she&apos;s a world record-holder, too. 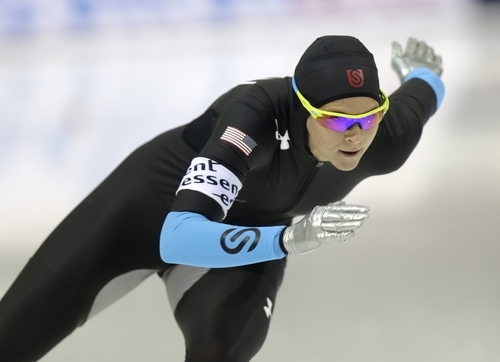 The 25-year-old Florida native broke the world record in the women&apos;s 1,000 meters Sunday on the final day of a World Cup stop at the Utah Olympic Oval, with American teammate Heather Richardson right behind her, also just under the previous record time. "I couldn&apos;t be happier right now," Bowe said. "I&apos;ve daydreamed about it. I&apos;ve dreamed in my sleep about it. And when it becomes a reality and finally hits you, it&apos;s a dream come true." Bowe finished in 1 minute, 12.58 seconds to break the previous record of 1:12.68 set by Canada&apos;s Christine Nesbitt last year in Calgary, with Richardson clocking 1:12.61. It was the fourth world record set during the three-day event, in addition to countless national records on the fastest ice in the world, and helped raise the Americans&apos; weekend medal haul to 12, including three gold. "I knew I needed to have a good opener," Bowe said. "When I saw my opener and proceeded to see a [28.65] on my first lap, which is the fastest lap I&apos;ve skated in a competition, I knew if I could just hang on it would be a really fast time. And it was." It was also the third time already this season that Bowe and Richardson have shared the podium. Between them, they have won six of the nine medals available in the three races at 1,000 or 1,500 meters that they have raced, illustrating just how irresistible a force they could be at the upcoming Sochi Olympics in Russia  much like Shani Davis and Brian Hansen at the same distances on the men&apos;s side. "We&apos;re right there together and we&apos;re going to continue training together throughout the year and hopefully get better," Richardson said. It was barely three years ago that Bowe finished her career as a point guard at Florida Atlantic and moved to Utah to try speedskating, inspired by fellow former in-line skaters such as Richardson and Chad Hedrick who had switched to the ice and excelled at the 2010 Vancouver Olympics in Canada. She adapted quickly, and has blossomed into the greatest threat to Richardson&apos;s own gold-medal dreams. But there is no bitterness between the two. They&apos;re good friends, and it&apos;s not hard for them to keep it that way. "In part, because we&apos;re racing against the clock," Bowe explained. "We&apos;re not scraping and scrapping out there against each other. Today, I came out on top. Tomorrow, Heather could come out on top. It&apos;s just awesome that we have each other. … It&apos;s definitely promising." In the men&apos;s 5,000 meters, reigning Olympic champion Sven Kramer of the Netherlands nearly broke his world record set six years ago in Calgary, winning in 6:04.59  just 1.27 seconds off his mark, after 121/2 laps of the track. And the day finished, appropriately enough, with another medal performance for the Americans, a bronze in the women&apos;s team pursuit. Bowe, Richardson and Jilleanne Rookard overcame a potentially disastrous slip to finish behind the Netherlands and Canada in 2:57.09, breaking the national record by some two seconds and securing a spot in the Olympic race in Sochi. "They would have had a chance to break the world record if Heather and Brittany had fresh legs," U.S. coach Ryan Shimabukuro said. "They would have come close, if they didn&apos;t break it."